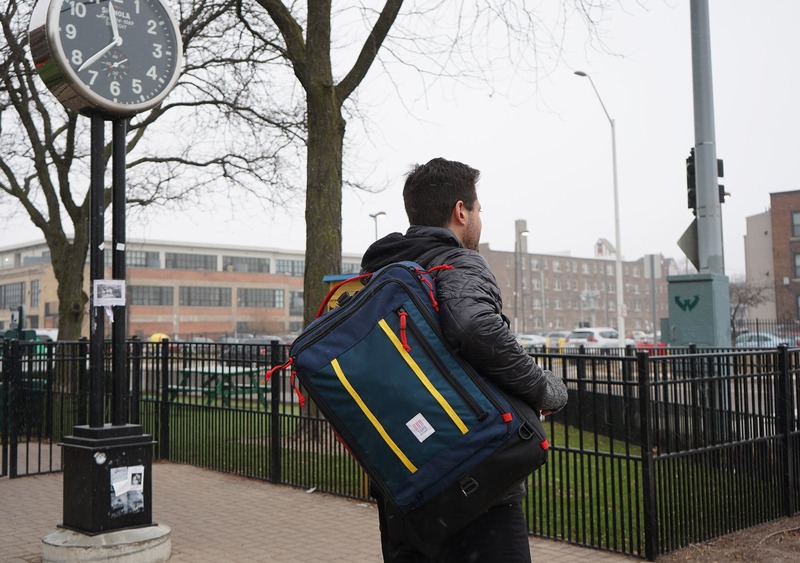 The Topo Designs Travel Bag offers some great organization in a classic heritage style, although we think the harness system is less than optimal. 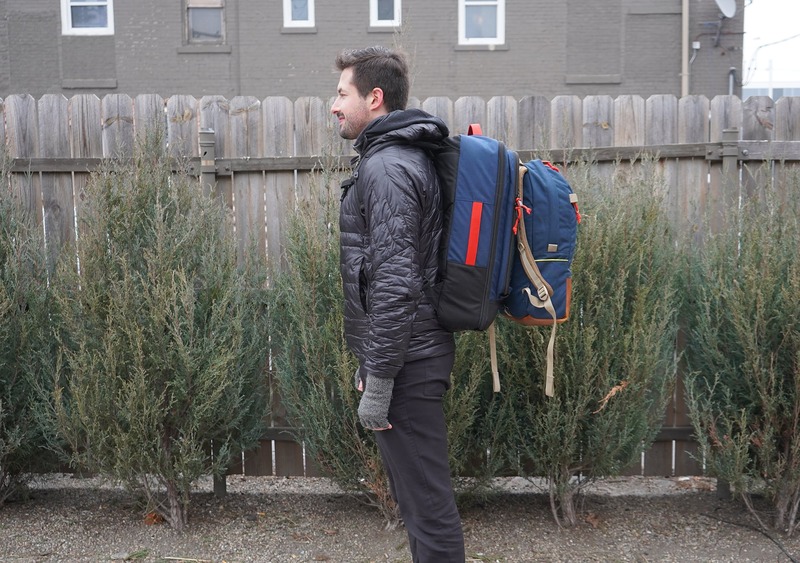 In this review, we’re taking a look at the Topo Designs travel bag. This is a 30 or 40-liter backpack—depending on which size you choose, we’ve got the 40-liter variant—and it’s got a lot of unique stuff going on. 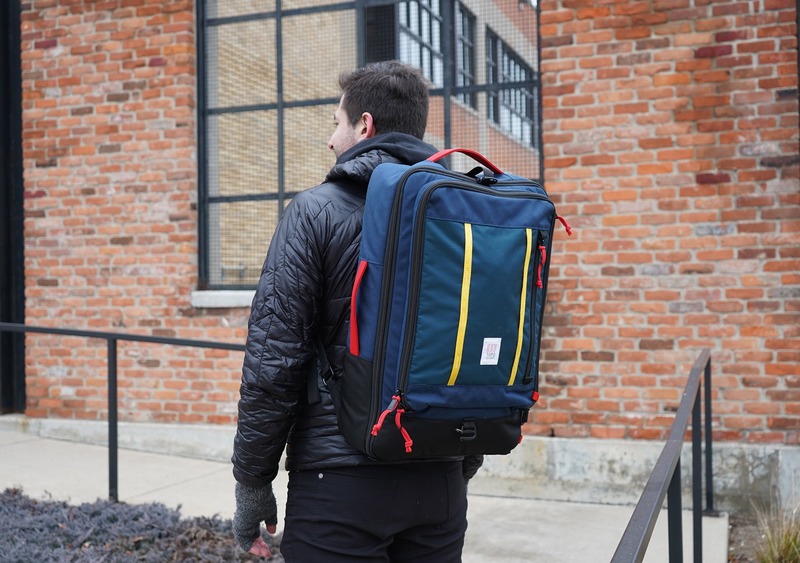 As a brand, Topo Designs has a pretty solid track record of creating backpacks and other gear that has a vintage, heritage-style look. The kicker is that, although their stuff has an old school look and feel, it’s all generally decked out with top-notch materials and awesome features. We’re happy to say that the Topo Designs travel bag has all of this and more. So let’s check it out! 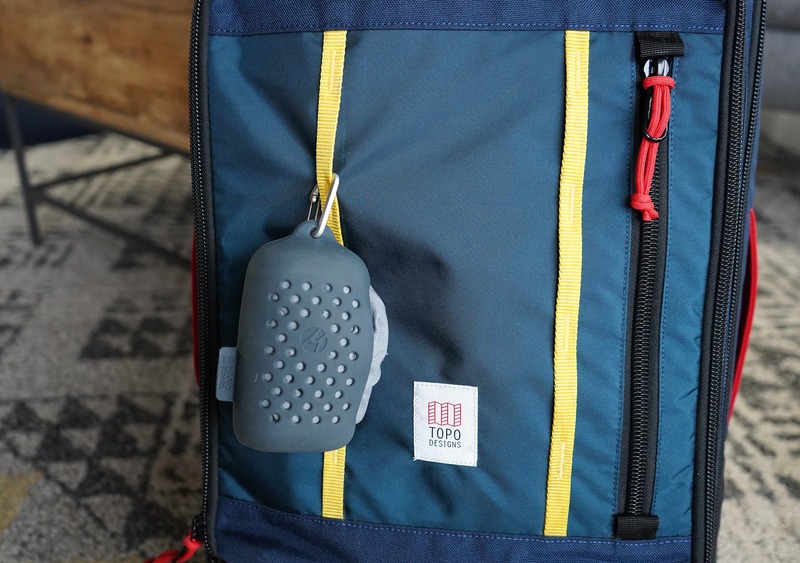 Much like their other gear, Topo has gone for a really strong heritage vibe with this pack. It kind of reminds you of bags that were made in the ‘70s, with all the bright colors and the boxy shape. It’s a bit different from the type of aesthetic we normally go for, but we’re certainly digging it. From a branding perspective, there’s a white logo on the front of the pack, which is pretty classic Topo Designs—they have this on virtually all of their products. There is also a small Topo tag on the interior and a logo on the messenger strap as well (more on that later). From a materials perspective, the exterior fabric is 1000D nylon. It’s important to note that the 1000D nylon here is not CORDURA®—which you will see on a lot of their other bags—but just normal, no-frills nylon. Towards the bottom of the bag, there is a kind of ballistic weave that will add a bit of durability—this is a pretty common area to add some reinforcement, as it will constantly be hitting the ground and rubbing up against things. There is also 400D nylon pack cloth on some of the exterior as well. The interior liner is a 210D pack cloth with a brilliant fluorescent color, which allows you to really see your gear and what’s going on inside the bag. Side note: Some of the colorways offer 1680D ballistic nylon, which gives a slightly different look and feel—as well as some more substantial durability—than this ordinary 1000D nylon. Make sure to keep an eye out when you’re selecting your color! All the zippers on the bag are YKK, and the main compartment offers a super beefy #10 zipper. You really can’t get much better in terms of durability and quality, as far as we’re concerned. If you manage to break that bad boy, drop us a line because we want to hear what in the world you were up to. 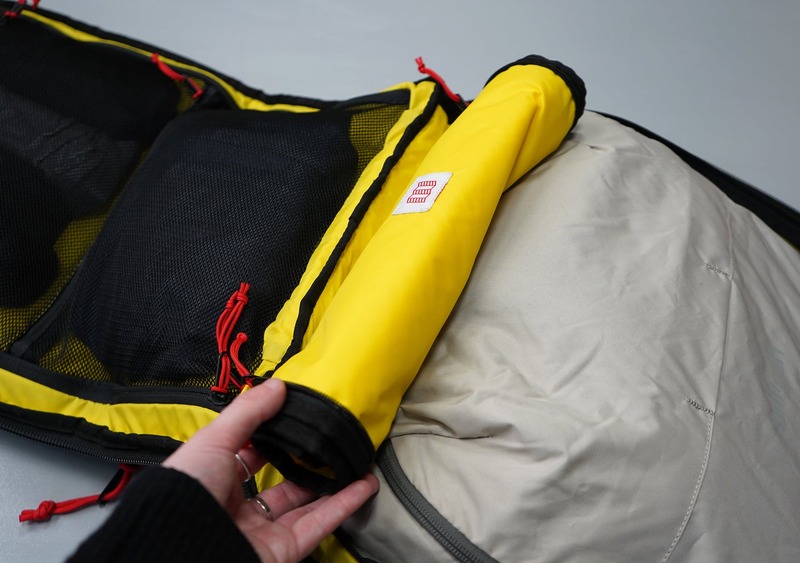 There is also Woojin and Duraflex hardware used for the plastic bits across the bag—specifically, at the strap adjusters where the harness system attaches and where the sternum strap attaches. 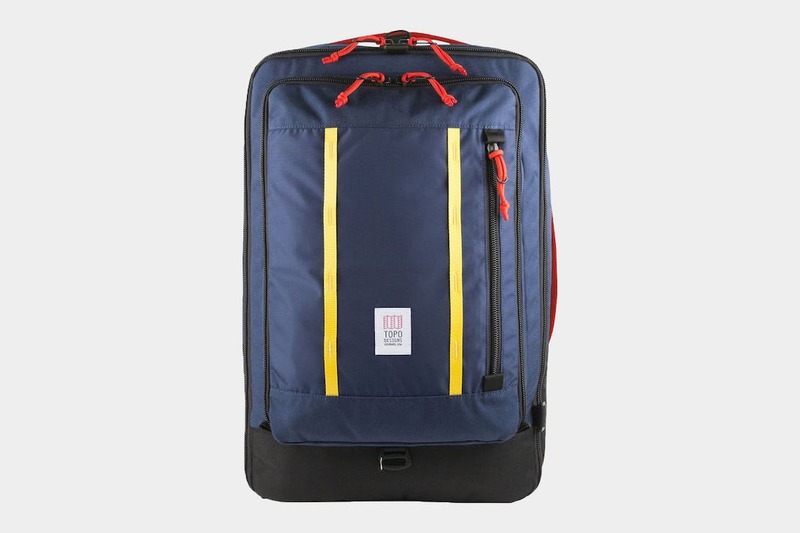 Finally, we should note that while Topo produces a lot of their bags in the USA, this travel bag is produced in Vietnam. So, take from that what you will—we’ve seen plenty of high-quality bags made in Vietnam and plenty of low-quality bags made in the U.S., so we don’t think this is a huge factor. In classic Pack Hacker fashion, we’ll kick off the external components with the harness system. To be honest, we think this harness system is kind of…so-so. We have a couple of nitpicks with it, and we’ll start with one of the biggest—the straps. These are decently comfortable—there’s some thick padding, for sure—but we have certainly seen better straps on the market. 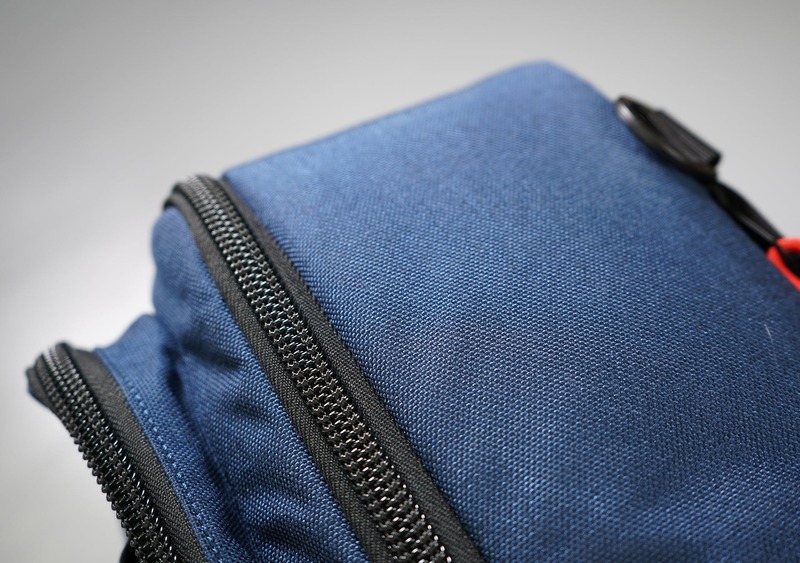 A lot of backpacks will use a higher-density foam that adds a bit more comfort and will also stay nicer for longer. These straps aren’t 100% ideal, although they’re not terrible. There are some load lifters at the top which are great for pulling the load closer to your back, and we think they’re ideal on a pack of this size. Once you get to about 35 liters and up, we start to look for those load lifters—so this is a welcome addition in our eyes. There are some D-rings at the bottom of the straps for additional attachment options, as well as two pieces of MOLLE-like material that can be used to attach additional accessories. So there’s a ton of room for modularity and customization on this pack, which we love. There is also an option to attach and remove a sternum strap here. We’re not 100% thrilled with this type of attachment because it’s easy to pull off. We typically prefer a more permanent attachment point, whether it be a buckle or something else, because we have lost a couple of sternum straps while testing bags other than this one. But being able to detach a sternum strap does have its merits, as you can keep the bag a bit “cleaner” and free of dangling straps if you don’t intend on using it. 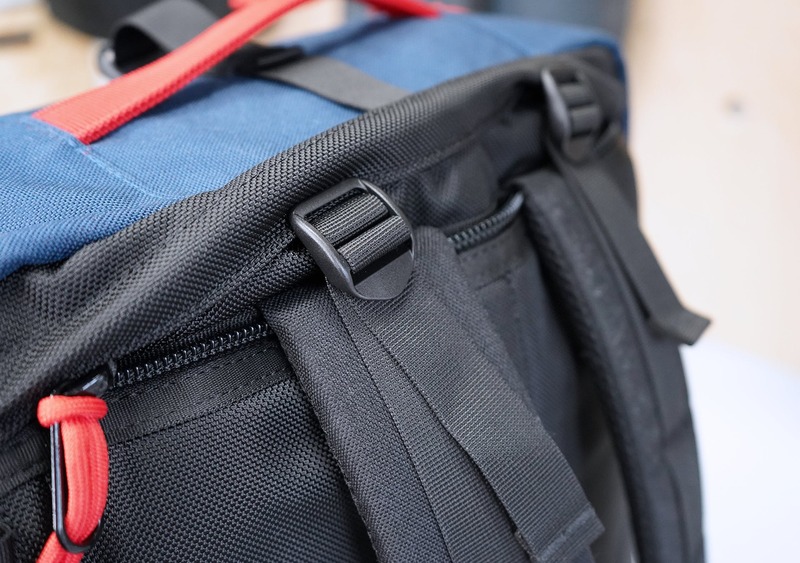 This entire harness system can be hidden, which is convenient for air travel when you don’t want a ton of additional straps whacking around, and especially if you want to check the bag. The way you go about this is quite simple, all you need to do is unzip the top part of the back panel, detach the straps from the bottom of the bag, and stuff them in there. Boom. On the lower part of the harness system there is a hip belt that isn’t detachable, although it can be hidden. We tend to think anything over 40 liters should at least have the option for a hip-belt, and we were pretty excited to see that Topo has included it here. There are strap keepers on the hip belt to manage the excess dangling straps, however, you will not find strap keepers on the shoulder strap adjusters. Kind of a bummer, seems like it would have been an easy fix for Topo to add those in, but it’s not a huge deal. One other gripe we have with this harness system is the frame sheet, or lack thereof. When you’re wearing a bag of this size you’re definitely going to want some structure, and a frame sheet can help with that. We really feel like this pack could have benefited from an internal frame sheet. It helps improve the carry and just gives the bag a lot more structure. Popping your laptop into the dedicated compartment can improve this a bit, but we still feel like it could have been handled better. 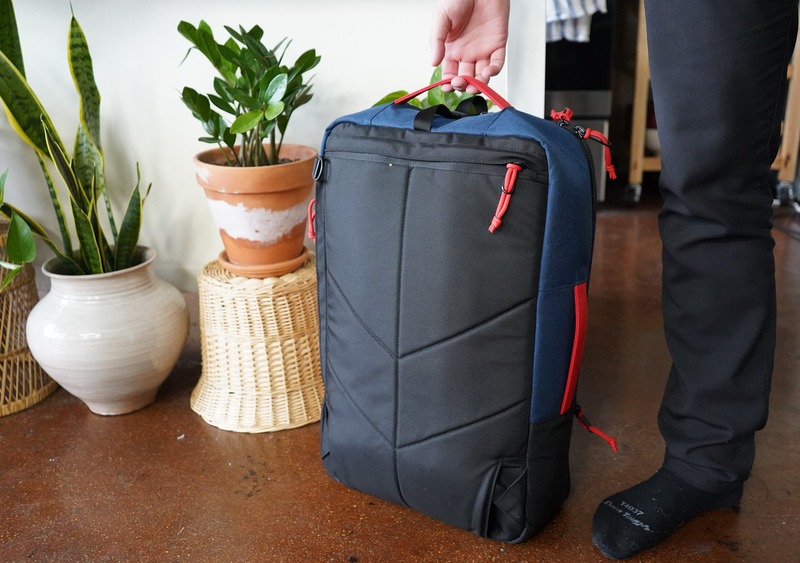 It makes this pack feel more like “a bag that you can carry on your back,” as opposed to a true backpack. But then again, that kind of comes with the territory when you have a bag that can be carried three different ways! Yes, there are three different carry-options for this bag. Backpack Mode. 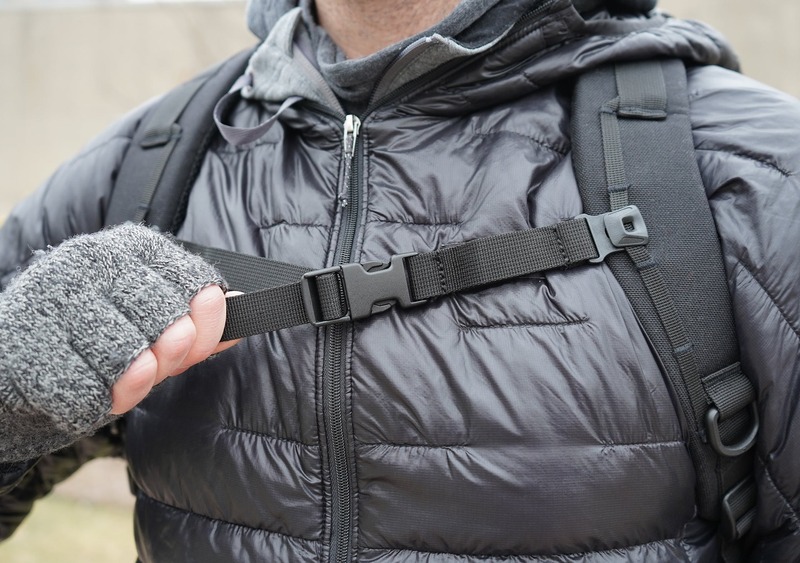 This uses the harness system we just discussed, and you can carry it like a backpack. Brilliant. 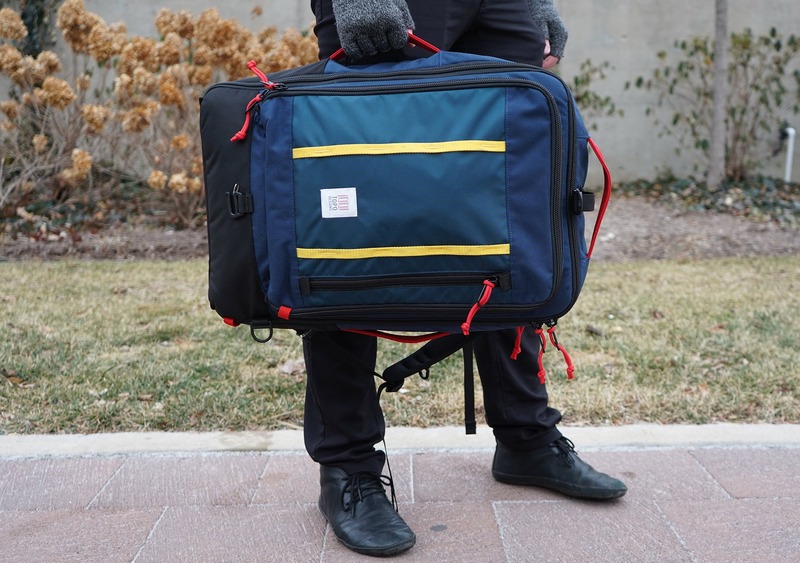 Messenger/Duffel Mode. 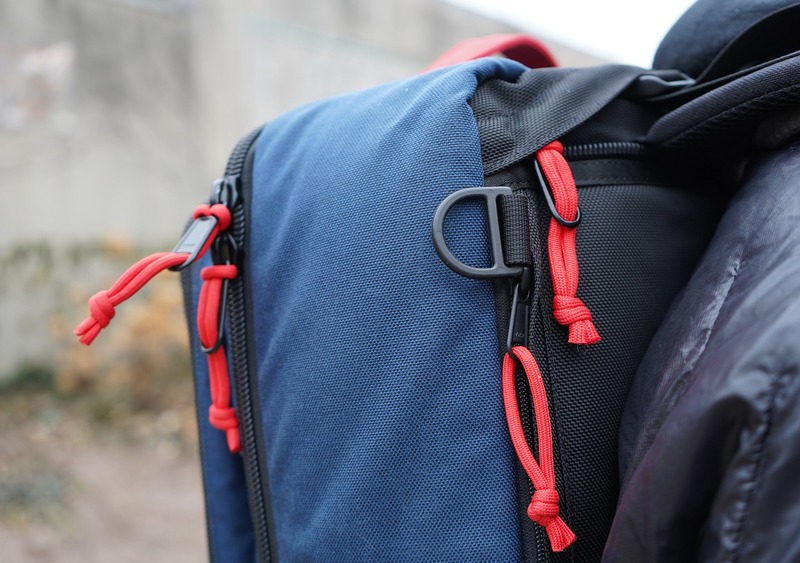 This uses the D-rings on the side of the pack and the removable shoulder strap. Just attach the strap to the D-rings and you’re good to go. 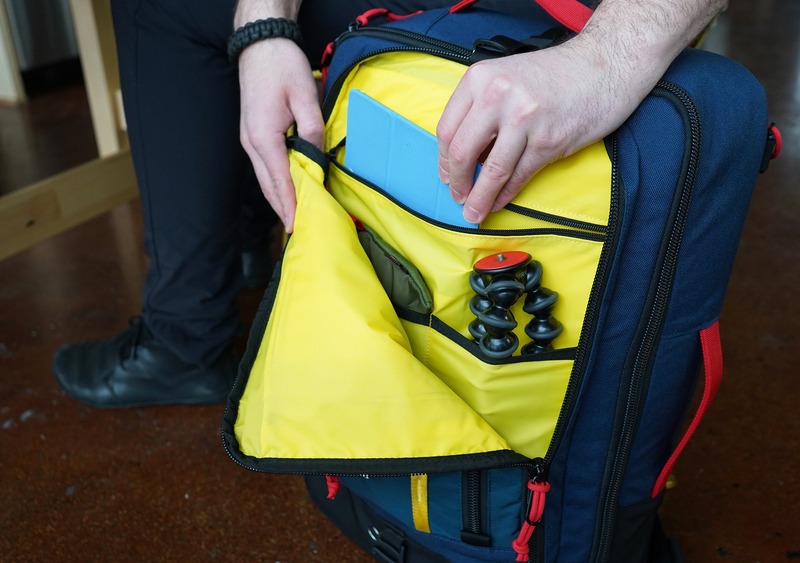 Most of us at Pack Hacker are partial to backpacks, so we haven’t been using this option much, but it may be a viable solution for you. This could be especially nice if you’re carrying it with another backpack. But in general, we think this bag is a bit too large to work as a messenger/duffel. Moving on, there are two strips of daisy-chains on the front of the pack that provide some additional attachment options as well as a nice pop of color. You can actually use these to attach other smaller Topo bags, which is pretty wild. The Topo Designs Daypack fits well here, but it does make the setup fairly large. Although, we have to say that once you start bulking this thing up with a lot of added weight and accessories, the lack of frame sheet definitely starts to become even more of a problem. The carry isn’t quite ideal to start with, but it’s definitely worse if you have another fully packed additional bag on top of this thing. It also obstructs the opening of the travel bag, and you’ll quickly become a human wrecking ball when you turn around in a crowd of people. Needless to say, we think attaching another entire backpack to this travel pack is a bit overkill. But we do like that Topo has given us the option, and we think smaller accessories could work well. Plus, if you don’t like it, don’t use it! Let’s kick things off with the dedicated laptop compartment. First things first, this area is seriously small. You can technically fit most 15-inch laptops in here, but it’s going to be tight. We’ve tested it with a 15-inch MacBook Pro and you have to put it in diagonally and then kind of shimmy it the rest of the way in. It’s a bit of a process, and not very ideal. Once it does get in, there is ample space inside the compartment—it’s really just the zippered opening that’s a little bit too small. Moving on to the front of the pack, there is a vertical quick-grab organization pocket. There’s some really great stuff going on in here—there are two zippered pockets that fill out the bottom half, a keyring, and then the rest of the pouch, which has a lot of room in it. This is a good area for tossing a compressible jacket or anything else you want quick access to. We particularly love the fact that Topo chose to include zippered pockets here, as we’ve noticed that other brands will just do a standard pocket sans zips. The problem with that is that as soon as you start moving the pack around (ie; wearing it), that stuff is going to fly all over the place. Behind that front pocket there is a big horseshoe compartment with some additional organization inside. 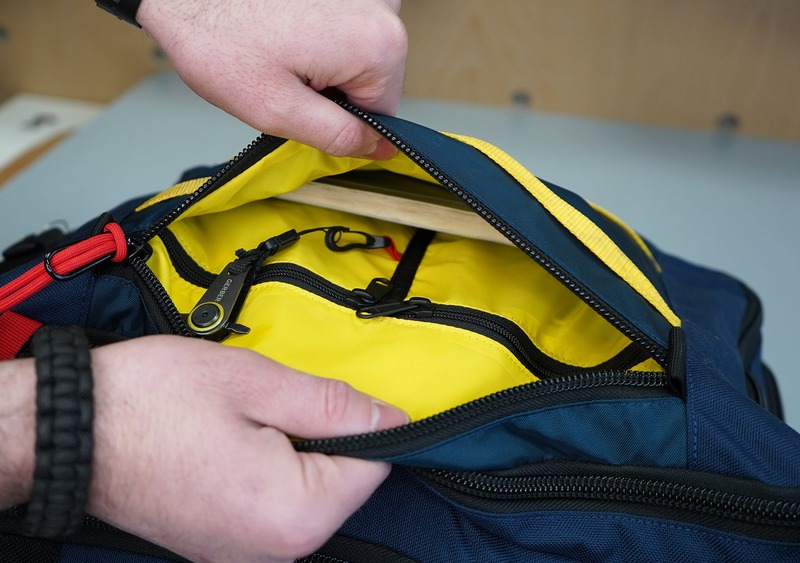 We should also mention that the paracord zipper pulls on this pack can be weaved through a loop along the bottom of the zipper track to make it a little bit harder for someone to open your bag and access your stuff quickly. Love it. Inside this compartment, there is a zippered pocket towards the top which is great for flatter items like documents or larger notebooks. There is also a 1/3 and 2/3 partition pocket for additional organization. Now let’s get into the main compartment of this bag. This area fully opens up in the horseshoe style, and you’re greeted with a couple of mesh partitions on the front. We’ve found these to be great for socks, underwear, or any other flatter, smaller items that you want to compartmentalize. And there’s one sneaky thing on the back—there is a zipper under these pockets that opens up this entire area, offering a separate compartment that is super handy. You can use this for added organization, but if you don’t want to use it—no worries. You won’t be sacrificing any space by not using it. Behind the top flap, there is an additional divider partition with two 210D pack cloth pockets. On the interior, you’ll notice they still have the red zipper pulls, however, they are thinner paracord than the stuff on the outside. This keeps everything a little more minimal and compact, which we like. It’s a nice, small touch that clearly shows the folks over at Topo Designs really put some thought into every inch of this bag. Moving on, if you open up the divider within this area you can finally reveal the actual “main” compartment of this pack. It’s basically a giant bucket. 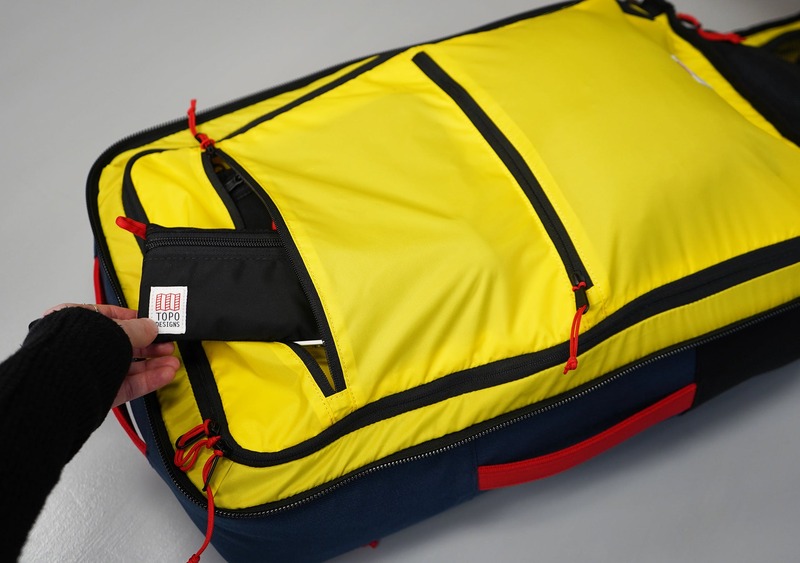 We like the zipper partition here, as it kind of acts as a standalone compression system which protects the space on the other areas of the bag. 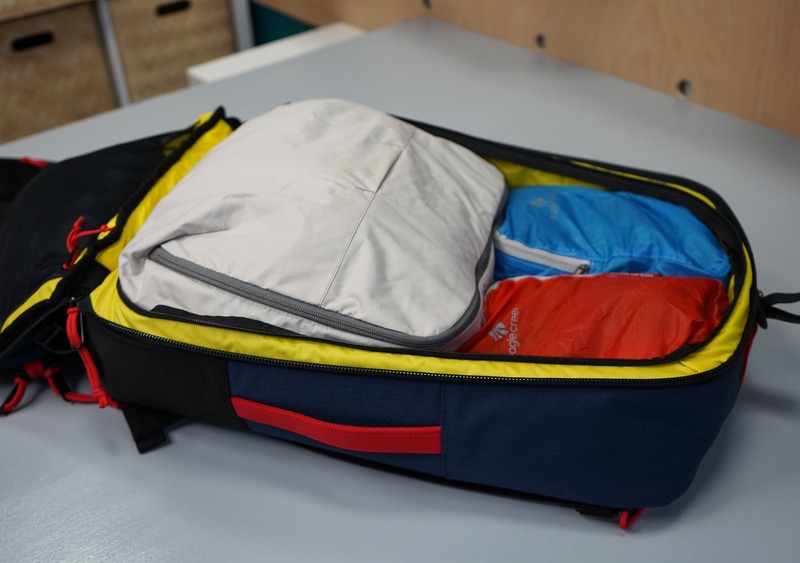 If you want to jam your clothes in there and compress it down that totally works, but we’d recommend using packing cubes. 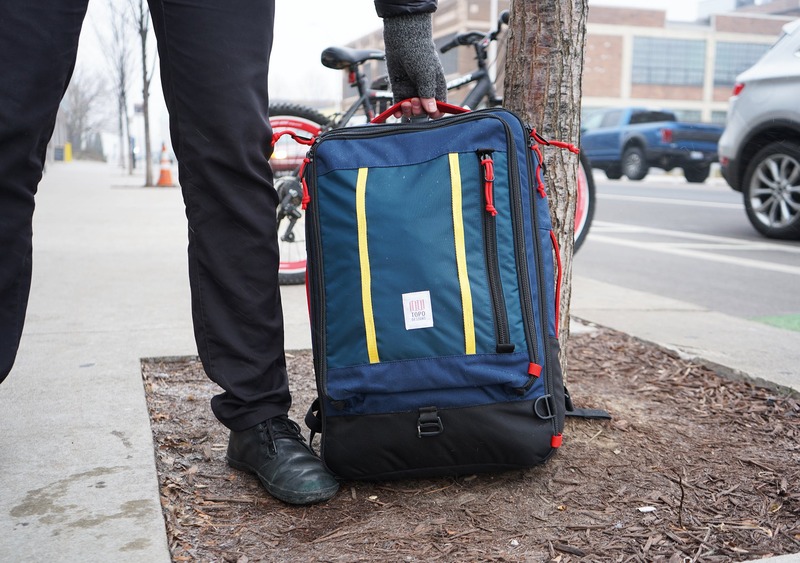 We’ve been using them during our time testing this bag and it makes the whole packing experience a lot more pleasant and efficient. You should also know that the partition is totally optional! So, if you don’t wanna use it you can just roll it up and stow it towards the bottom of the bag. This is very similar to the way the Peak Design Travel Backpack handles their partition, and we like both of these methods. The only difference is that with the Peak Design pack, there is a dedicated pocket that you can stow the rolled-up partition in. Overall, it’s a really slick system, but it could be improved a bit with an added pocket so you don’t have a ton of excess fabric flapping around. As for packing cubes, any will do, although Topo does offer a couple of different sized packing cubes that will fit nicely in here. And lastly, we just want to touch on the boxy shape of this bag. If you like that look on the outside, great. 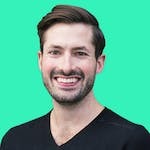 If you don’t like it—which is understandable—you should at least know that with the boxy shape comes a lot of great functionality. The overall shape of this bag, and the corners especially, make it easier to optimize every little piece of space inside versus other packs that have more curved corners. So, although it might look a bit odd, the boxy shape does serve a purpose. 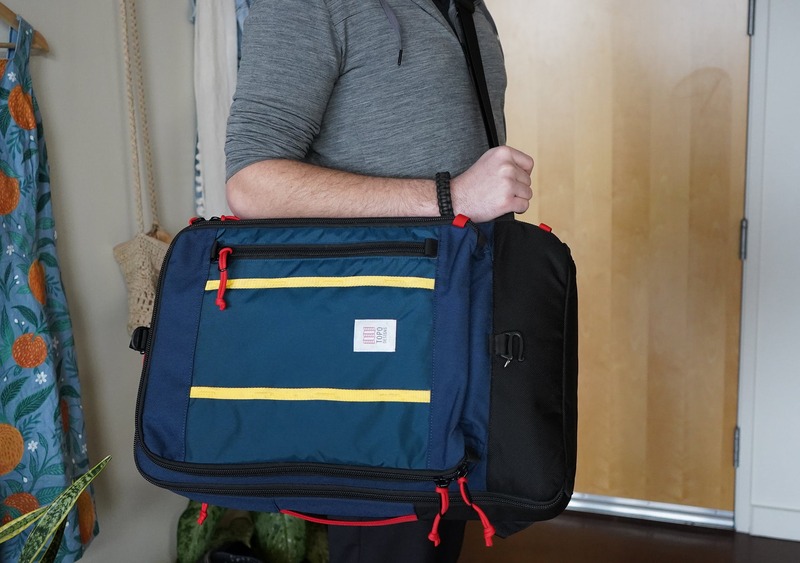 At the time of this review, we’ve been testing the Topo Designs travel bag for two weeks, mostly as a daily driver on the way to and from coworking spaces and coffee shops. And of course, it’s always loaded up with a ton of gear. Overall we’ve really enjoyed the organizational features on this pack, even if the frame sheet and harness system is a bit lacking. There are no durability issues to report as of yet, except for a small fraying piece of fabric on the Topo logo. We’ve actually seen this exact same logo fraying crop up with a couple other of their products, which is a bit odd, but obviously not a huge issue. Other than that, we don’t really have any concerns around how long this thing is going to hold up. Loving the look of this pack and all the internal organization. Psyched to test it out! The lack of frame sheet is disappointing, but loving just about everything else on this pack. Still enjoying this pack on the whole. Still not enjoying the harness system as much as we’d like. The Topo Designs Travel Bag offers some great organization, thoughtful design features, and a pointed heritage aesthetic. 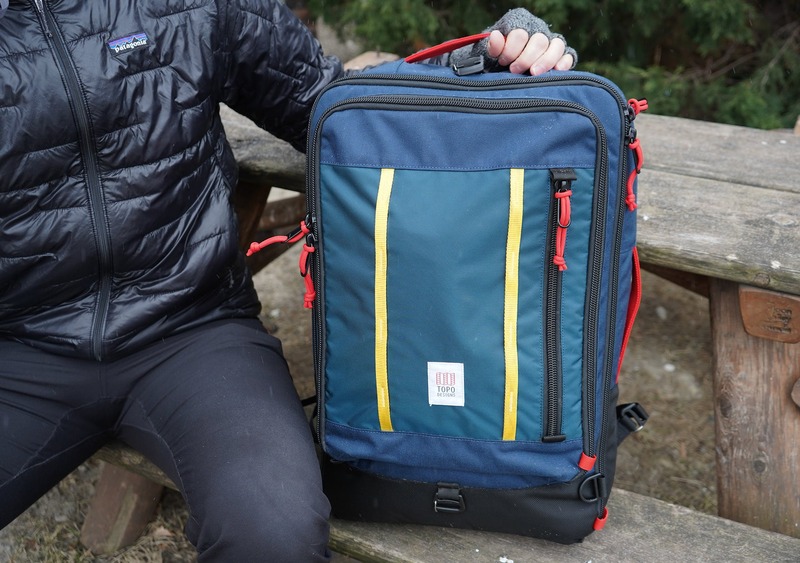 If you can get past the laptop compartment not being an ideal size and you have no problem with the less-than-optimal harness system, there are a ton of pros and unique features on this pack. We love the compartmentalization and organization, as well as the excellent zippers. All in all, we think this bag could serve your one bag travel needs very well.